Posted 6:37 pm by Blake & filed under Uncategorized. World Trust is developing a program to prepare our youth to build a more equitable and sustainable world. 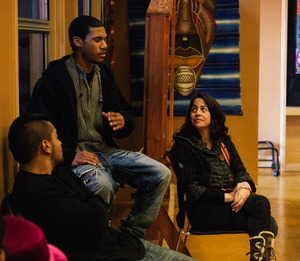 We hosted our first Youth Event in Oakland on March 9th, featuring spoken word artist Rhummanee Hang and facilitated by Shakti Butler, PhD and Jelal Huyler. Forty-five participants aged 13-24 engaged with dialogue about the system of racial inequity with Cracking the Codes. Dr. Butler traveled to Norway to offer the conference keynote Paradox & Transformation: Creating a Bold and Equitable Future. This government conference entitled Belonging addressed Norway’s struggles with integrating immigrants into a traditional culture. In less than fifty years, Norway moved from being one of the most homogenous countries in Europe to one with a population that is increasingly multicultural. Twenty-five percent of Oslo residents, for example, are not of ethnic Norwegian background. These two events are just the beginning of the exciting journey Cracking the Codes will be taking in 2013, engaging new communities in the conversation on race.